The following article originally appeared in the Economic Times's ET Magazine on June 11. I rather fancy it is Shakespeare who says that when a prime minister is feeling particularly braced with things, Fate sneaks up behind her with a bit of lead piping. I recalled the Bard’s musings on Friday morning after Jeeves trickled in with the Fleet Street rags and the tall glass that heals. The news left me speechless. It required the better part of the day for me to get the gist of the situ. By sundowners, tucked away in a quiet corner of the Drones Club, I was able to muster the facts. 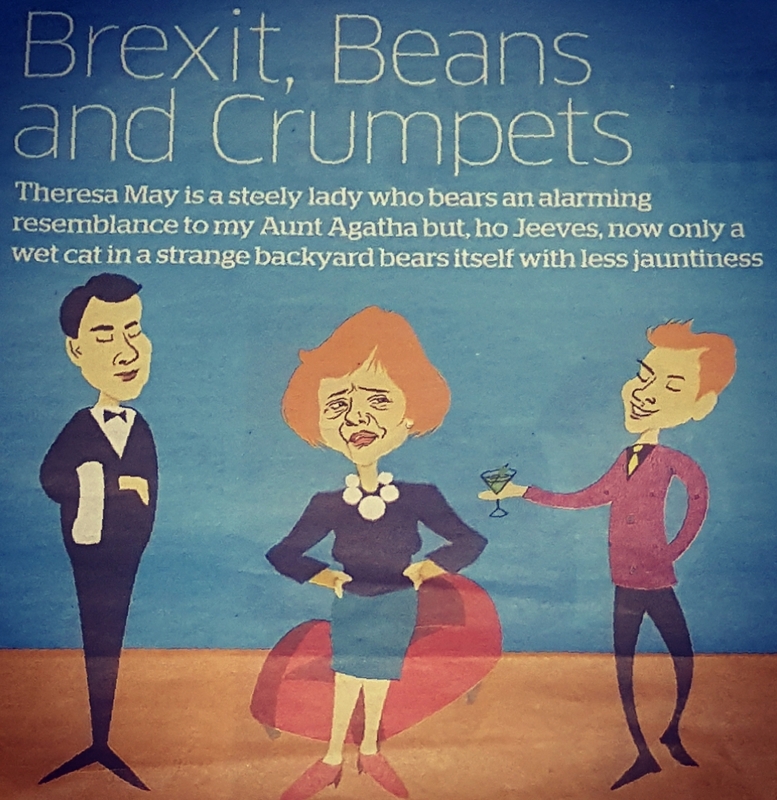 Theresa May is a steely lady who bears an alarming resemblance to my Aunt Agatha, the one who chews broken bottles and kills rats with her teeth. She would normally be a beastly sort to face over a negotiating table, or breakfast for that matter. But now only a wet cat in a strange backyard bears itself with less jauntiness. The old girl’s not much of a gambler. Besides snap elections, she could only have done worse by betting two-to-one on Gussie Fink-Nottle pinching a policeman’s helmet. Now she’s had to throw in her lot with the Democratic Unionists, a queer tribe composed of dour Northern Irish types. They’re the sort to strike the fear of God in God. Meanwhile, Corbyn and his comrades have cast off their gloom and stiffened their spines. I threw the mind back to the days when even the Morning Star said old Jeremy was too Bolshie for Downing Street. He normally looks like one of those things that come out of dead trees after the rain, but the whiff of victory has bucked him up like a tonic. The rest appears to be out, if not yet for the count. The Scottish Nationalists find themselves a little less Scottish and little less Nationalist. I imagine they’re all skulking around Glasgow with shifty, hangdog expressions. It is never difficult to distinguish Scottish grievances from rays of sunshine. We now find ourselves in a rum situation without the foggiest idea as to what to do. 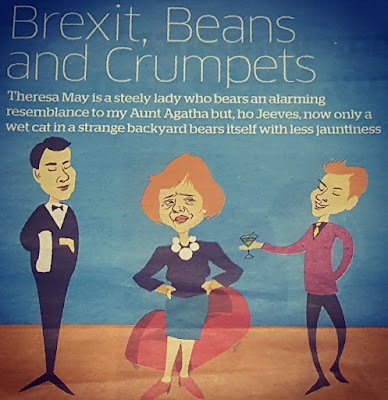 The crumpets on the Continent are apt to look with a somewhat jaundiced eye on the Home Counties, and eager to shut the door on Queen and Country. They’re a vindictive lot. Across the pond, the Yanks remain in thrall to a bovine chappie the colour of turmeric who’s busy applying the scorched earth policy to human dignity. Theresa & Co thought the best thing under the circumstances was to run around the old colonies, waving the flag and fizzing with excitement. A fat lot of good that’ll do. I left the Drones, scratching the old bean. “It’s a fairly rummy matter, Jeeves, this Brexit,” I said upon my return. I took to an early bed, not wanting to miss my beauty sleep. Conceive my astonishment, therefore, when waking on the morrow and sitting up to dig into the morning teacup, I beheld a card on the tray. In the sitting-room, I found a breathtaking cove. About seven feet in height, and swathed in black, he caught the eye and arrested it. It was as if nature had intended to make a human howitzer, but had changed its mind at the last minute. He was not the chump I took him for. I lent the good Wooster name to the cause, and for a second I was able to regard the world with some sunny cheeriness.